Another little rush hour shot. Over 30,000 bicycles ride past this point each day. If you have the time, have a look at this over at the Los Angeles Times. They asked me to guest blog and this is the inaugural piece on their traffic blog Bottleneck, comparing Copenhagen to Los Angeles. What an excellent article! It's very inspiring, I feel like I should find someplace to ride my bike to today even though I don't need to go anywhere! Thanks for sending us some inspiration! Mikael, congratulations on an excellent article in my hometown newspaper! I have been a fan of Copenhagenize and Copenhagen Cycle Chic for a couple of months now and I am glad that many fellow Angelenos will be exposed to wonderful idea of cycling as a viable alternative to the automobile. you two are so wonderful! thanks so much. i'm pleased you liked the article. Yes, thanks very much for the article. I love your blog, it's inspiring to read. Especially since the politics surrounding cycling in Los Angeles can be really frustrating some days. I really wish everybody in the city would read your blog and start to see the potential of our own city. thanks bekka! there is so much LA can do. fingers crossed they start doing it! 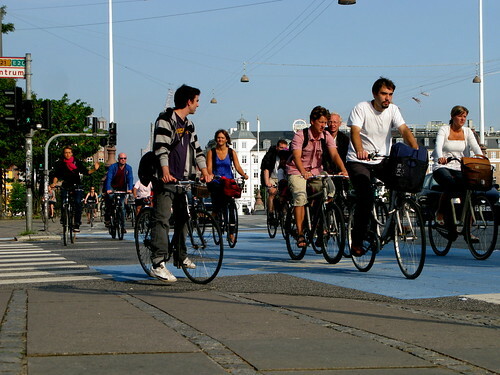 i remember being so intimidated by the bikes in copenhagen. i spent my three months there walking and riding the bus because i was so afraid that i would hurt myself or someone else if i had tried to ride! now i wish that i had taken advantage of the opportunity to learning to ride in such a welcoming environment. almost ten years later i've dusted off my bike and i'm starting to ride in los angeles. not for recreation, but to get from point A to point B. great article, and thanks for inspiring me! A to B is what it's all about, Nikki. Cool you're doing it. Welcome back to Copenhagen anytime!